The Zion Lutheran Church is a piece of German-American history that dates back to 1755. Originally known as the German Lutheran Reformed Church, it served Lutheran immigrants coming from Germany. The congregation held services in private residences for the first seven years. The original church was erected in 1762 on Fish Street (now Saratoga Street), a block away from their current site. The number of worshipers grew rapidly over the years and by 1808 the first building on the current church grounds was completed. It is one of only a few buildings standing that predates the War of 1812 and is the oldest Neo-Gothic style church in the United States. Between 1912 and 1913, the church completed several additions including the Parish House, bell tower, parsonage, and garden. The church possesses a number of historical artifacts including a piece of the Berlin Wall and plaques dedicated to the members of the church who died in WWI and WWII. The church boasts an impressive collection of stained glass. A number of the windows celebrate German heritage and achievements. The Industry Window in the Sanctuary Entrance has an image of the linotype in the bottom-right corner, a device invented by Ottmar Mergenthaler in Baltimore. The Zion Lutheran Church currently provides services in both German and English, making it the oldest church in the United States that has maintained uninterrupted services in German and the only church in Maryland to offer a service in German. 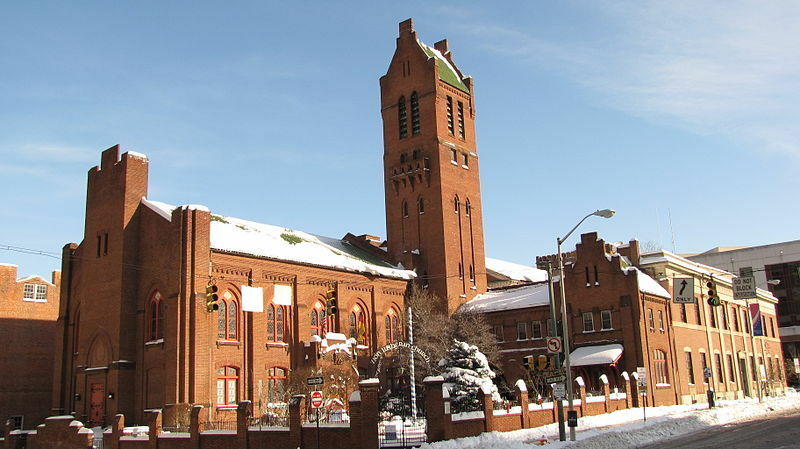 Nathan Dennies, “Zion Lutheran Church,” Explore Baltimore Heritage, accessed April 23, 2019, https://explore.baltimoreheritage.org/items/show/222.